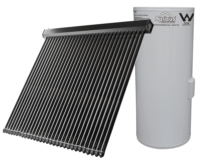 The Apricus solar collector is an extremely efficient thermal solar system. The secret is the combination of the innovative technology of the Apricus solar collectors, and the use of evacuated tubes combined with heat pipes & glass-wool insulation. All this makes the system environmentally friendly, maintenance free, frost resistant, and now, also very affordable.